1. Seasonal Low: As the average day/night temperatures in the Northern/Central Sub-Continent areas have shown a distinct warming up, and the -ve factor from the previous MW (last week) discussion shows some improvement (though still -ve). Heat waves are seen in the Central Regions and Eastern coast now. Last week's map of day and night temperature average of the anomaly explains this. Slightly bove normal in Northern/NW and Central Sub-Continent. But, the point to note is the "white" region stretching down from Western Rajastahn thru Western Maharashtra into Karnataka. This is attributed to the persistent below normal night temperatures. A prominent "white" is also seen in the East/Central region last week. However, comparison with previous years shows the difference this years. In 2010, the first 45c touched on 10th. April, and on the same day Nagpur was 44c, Delhi 42.8c. Soon on 15 th April 2010, Nawabshah (Pakistan) soared to 47c, Simla to 28.2c on 16th, Ganganagar, Akola and Hissar to to 46c. But, 2011 and 2012 were similar to this year. This year also, we are yet to reach 45c anywhere in the Sub-Continent, as was in 2011 and 2012. Into the 3rd. week of April now, and a prominent heat wave is missing. As on 18th. 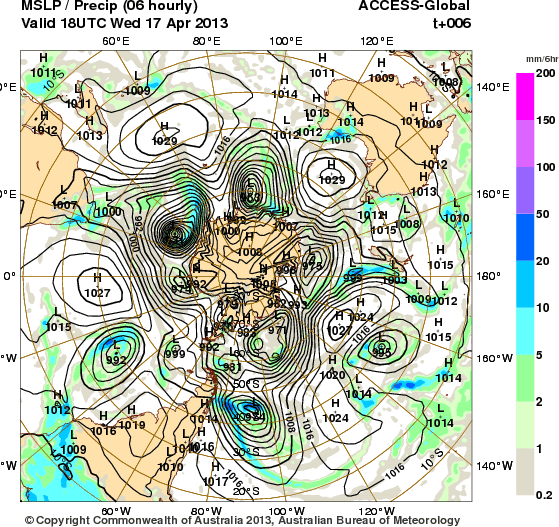 April 2013, the lowest pressure, in the Thar Desert region is at 1002 mb. 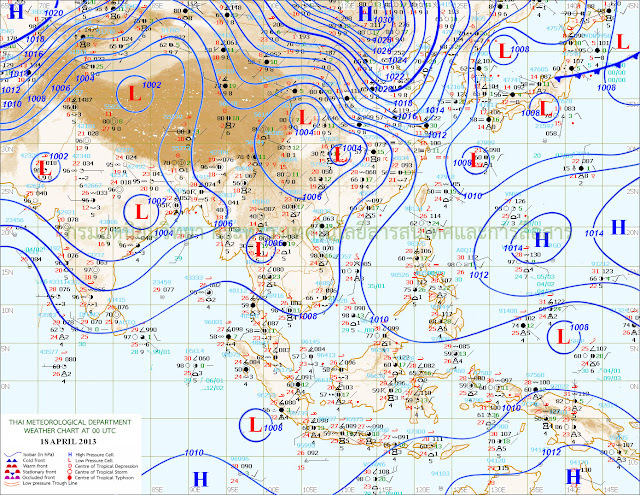 (though 2011 was 1006 mb, 2010/2012 was at 1002 mb this time) and this "low" region is restricted to a small area. As mentioned, it normally should reach a low nadir of 994 mb in June, and with 1008mb in the South Arabian Sea, a perfect gradient is created to attract the south -west winds towards the coast. The quick formation of an optimum Seasonal Low was delayed due to persistent A-3 and A-4, and absence of heat wave in Central and Northern regions of the Sub-Continent. 2. The ENSO is neutral in the Pacific Ocean, with a further warming of the SST in the past 2 weeks. NINO 3.4 is warmer by about 0.1c, but NINO 3 is cooler by 03c over the last 15 days. The SOI is at a high level at but remains within values indicative of neutral ENSO conditions. The latest 30-day SOI value is +5.1. 3. Last week, the Cross Equatorial winds, which originate from the Southern Indian Ocean as SE winds, and cross the equator to become South-West, were weak, and not developed due to the cyclones in the Southern Indian Ocean. With both the cyclones being a spent force now, we see the re-organisation of the Southern Hemisphere SE winds, as no hindrance is seen to occur now. In the Western Sector, the Arabian Sea branch is still struggling to get organised. 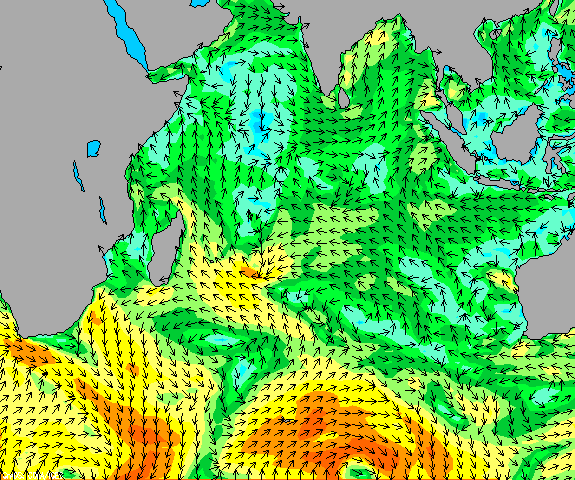 Here, sufficient wind speed off the Kenyan coast has yet to form the SE flow required. But should re-organise fast. SE winds are now getting organised and weakly striking the East African coast between the Equator and 5N, though still weak. The Northwards movement of the ITCZ will surely hasten and strengthen the winds. Today, we find, in the Eastern Sector, the winds south of the equator better organised for the Bay branch, in the region south of the Andaman Sea. SW Currents are seen off the Sumatra coast. Thunder cloud (Cb) developments are seen near the region South of the Equator. Currently, the weakening "Imelda" depression has created a "damaging" trough and pushed it Southwards, literally breaking the Mascarene high pressure zones in the South Indian Ocean. Main High reading now 1029 mb, and 2 more Highs (in the forming) have been observed, one at 1018 mb and another at 1025 mb. between Madagascar and Australia. The "Power House" of the Monsoon winds is slightly behind schedule, for this time of the season. 4. But the pre Monsoon Low in the Bay is still elusive. As discussed, we should normally see a low sometime after the 15th. of April. The high pressure region in the Bay, at sea level, no longer prevails. Never the less, the encouraging factor is the likely formation of an UAC in the Andaman Sea. Seeing favourable winds, and a slightly positive MJO still in the region, we see this as favoring a low formation. But, it has to be quick, as the positve MJO moves away Eastwards by the 25th. It is forecasted that a negative weak MJO phase may settle in the Bay region last week of April. This parameter, "normal" and tilting towards "favourable" as on date. I have put up the SST of last year on date. Comparison with this year shows it is favourable in the South Indian Ocean, where cooler waters will create a High pressure quicker. 5. 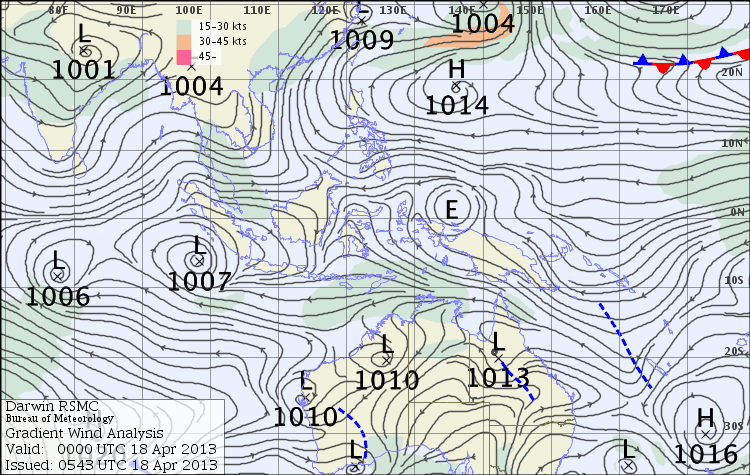 To bring the existing SE winds above the equator, the ITCZ should move northwards. Around 1st. of May, this should cross the equator. The ITCZ should now come back to its Northward position, as the effectives "Lows" created by the Rossby Wave have fizzled out. The Western end is still dipping to around 5S, but the Eastern end has moved Northwards and is almost at 10S. Parameter:1) Normal, 2) Normal. 3) -ve, 4) Normal, 5) Normal. Most parameters are "Normal" as of today. In today's situation, Monsoon arrival in Kerala could be on normal dates in Kerala and the Bay Islands, and the NE states. No model can commit from today when the Monsoon can arrive. Quantum of rain forecasting in the month of April, for a period right through September is an impossible task. Next MW up on 26th. April with firm Dates of Monsoon Arrival. Rajesh sir great explanation, but i have a query, that is ' all 5 parameters can they become positive as of four are normal and one is negative . sam: Like i said,in my last line, any factor can change...and that is what we monitor. I understand this article related arrival of monsoon date. But my question is about missing heatwave. Is it true India got good rains in 2010 because of severe and early heat waves. And less rains in 2011, 2012 due to lack of severe heatwaves. If we don't see heatwave in remaining period of summer, will we get less rains in 2013 ? Dattaraj: Heat wave is one of the factors influencing the key parameter that is the seasonal low. It is no doubt important for date, and important for initial (June) quantum..to a lerge extent. But south India is already in heat wave. AP SE andhra touched 45degrees !!!! today - due to this BANG close proximity touched 37!! Mining,nature abuse,desertification. In few days AP will touch near 50s and BANG near 40s. This pattern is seen for last 3-4 years with droughts. 20-30years back BANG max temperature was 30deg and MAR-APR used to be cold. Imagine today summer starts FEB itself and temperature nearing 40s. +10degrees increase in something which is of great concern. AP Rentachala,Ongole again touched 45deg today. Intense heat similar to last year.